Worcester (pronounced 'Wuh-ster'; pop. 93,000) is the county town of Worcestershire. The town is not the most charming of England, but has a few nice Tudor and Georgian buildings, a fine cathedral and an excellent porcelain museum. Worcester has also acquired international fame with its Worcestershire Sauce. Futhermore, Worcester claims the oldest daily newspaper in the world, Berrow's Worcester Journal, which origins date back to 1690, as well as two prestigious public schools,, the Royal Grammar School Worcester (founded c. 1291) and the Cathedral School (refounded by Henry VIII in 1541). Worcester's most famous citizens was Sir Edward Elgar (1857-1934), who composed the world-famous Pomp and Circumstance Marches, including Land of Hope and Glory, the anthem of England at the Commonwealth Games, and March No1, used for the graduation ceremonies in the United States. 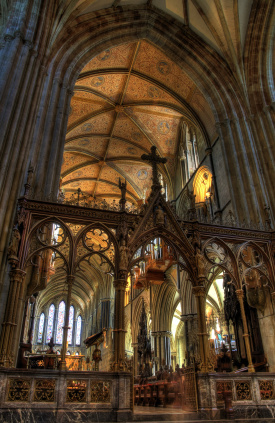 Every three years Worcester hosts the Three Choirs Festival, presumably the oldest music festival in Europe, alternating with Gloucester and Hereford. 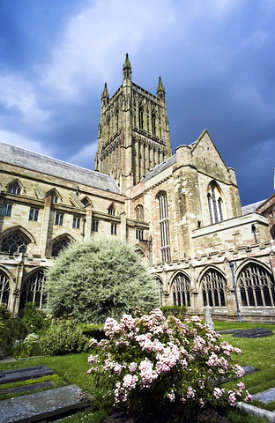 Worcester Cathedral was founded on the banks of the River Severn in 679 by St Theodore of Canterbury . Nothing remains of the original cathedral, and the construction of the present structure was started in 1084 by Bishop Wulstan (later canonised as St Wulstan) and boasts the largest Norman crypt in Britain. The most famous 'resident' is King John I (of Robin Hood fame), the brother of Richard I "Lionheart", best remembered for his disastrous reign. King John is interred between St Wulstan and St Oswald. Prince Arthur Tudor, the elder brother of Henry VIII, who died from a fever at age16, is also buried in the cathedral. The cathedral is open every day from 7:30am to 6pm, and admission is free. There are guided tours of the Royal Worcester Porcelain Works, the longest running porcelain factory in England, operating since 1751, and granted royal warrant in 1789. The adjoining Visitor Centre recounts the company's history, while the Museum of Worcester Porcelain boasts the world’s largest collection of Worcester porcelain, represented in the Georgian, Victorian and 20th Century styles. Notable historical buildings include the timber-framed Greyfriars (built in 1480), the Guildhall (built in 1722), and the Commandery Civil War Centre (founded in 1085). 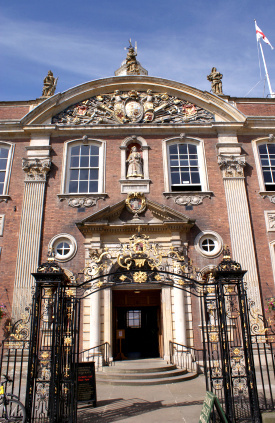 The Worcester City Art Gallery & Museum (admission free) hosts contemporary art exhibitions as well as a very wide range of historic artefacts, from Paleolithic hand axes and embroidered Chinese boots to 19th century paintings and Worcester sauce machine. There are direct trains between Worcester and London Paddington (2h30min, £27.40), Hereford (1h10min, £6), Gloucester (40min, £6.50) and Birmingham (40min to 1h10, £5.30). National Express has coaches to Birmingham (45min, £3.50), Gloucester (1h, £4.75), and Bristol (1h20min, £12), but no direct connection to London (you'll have to chang at Birmingham).